Zamadol Melt (Tramadol) 50mg 60 tabl. Zamadol (Tramadol) 24h 150mg 28 tabl. Zamadol (Tramadol) 24h 200 mg 28 tabl. Zamadol is an opioid analgesic, a morphine-like medicine, with a strong painkilling effect. The active ingredient in Zamadol is tramadol. Tramadol was introduced on the international market in 1977. Zamadol (Tramadol) is available on prescription only. It is prescribed by doctors to treat pain. When an area in the body has been damaged, a pain signal is sent to the brain via neurotransmitters. The brain responds with muscle activity, for example by moving the hands away from the heat source, or with an emotional reaction, such as fear. Although these responses are useful in many situations, they are often no longer useful when it comes to illnesses, operations or previous injuries. The first step in pain control is usually treatment with simple painkillers, such as paracetamol, acetosal or ibuprofen, if necessary followed by paracetamol with codeine. If these painkillers are not effective enough, doctors may prescribe Zamadol (Tramadol) for coping with the pain. Tramadol works by blocking or reducing pain signals traveling between the nerves and the brain. As a result, the pain subsides and becomes more manageable. 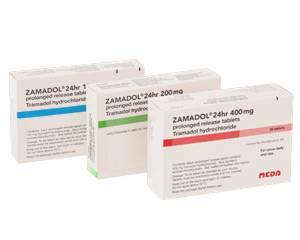 Zamadol is available in two different forms: Zamadol tablets in strengths of 150 mg, 200 mg and 300 mg. Zamadol Melt 50 mg with a slow-release formulation. This means that the tramadol in these tablets is slowly released over a number of hours into the bloodstream. Zamadol Melt relieves the pain for a longer period of time and therefore needs to be taken less frequently. The maximum dose of Zamadol is 400 mg daily. Orders for more than 400 mg, with a maximum of 30 days, will be rejected by doctors and pharmacies.